AN evening with two artists coming from Delhi may be deemed as a resurrection of the vanished art of storytelling known as dastan goi. It was a fully packed open air theatre in Bagh-i-Jinnah and the artists were faced with an audience which was familiar more with westernized art forms and literary styles than with the Perso-Urdu literary tradition and any art form or literary style originating from it. The typical Urdu audience which is usually seen thronging a mashaira was conspicuous by its absence. In fact, with the passage of time this audience too has grown estranged to this traditional art form. The last dastan go was seen and heard in Delhi during twenties of the last century. The poor soul, dejected by the poor response of the newly-emerged listeners who were seen rushing to bioscope, retired from dastan goi and went into oblivion. With his retirement, the age-old art of dastan goi vanished forever. The oral tradition of fiction finally came to a close. The new age bringing in its wake written fiction, short story and novel, had already begun. And now two dastan go have come out from the blue, landing amid an audience very different from the ones the dastan go in the past have been dealing with. A lady appears on the stage, utters a few introductory remarks and announces the entry of the two dastan go in her posh English. And there enter the two dastan go dressed in their traditional attire reminding as of the nineteenth century mannerism of Delhi. They sit on the masnad with a gao-takiya behind them. These two articles should be taken as an attempt on the part of the organizers or the producer to meet half way the dastan go’s demand of the paraphernalia, which helped him to recreate the world his dastan brought in its wake. In this situation the two dastan gos had to depend more on their dastan-telling talent and the imaginative capability of the audience present, and most of all on the evocative quality of the dastan itself for recreating the magical atmosphere the dastan carries with it. To my pleasant surprise, they succeeded in their attempt to the extent that the audience responded well by applauding them in accordance to the instructions from them. No clapping in the midst of the narration. Only “Wah, wah”, or a laughter when the situation demanded. Loud clapping only at the end of the episode, which was soon followed by the next. My surprise was of a different kind. How were these two young souls, Mahmood Farooqi and Danish Husain, able to learn and get versed in this extinct art. I put my query to Farooqi, who is the senior partner and solely devoted to the art, while Danish retains at the same time his relationship with the theatre. Farooqi had also been able to trace in some London library’s archives a three-minute tape recording of a piece of a dastan as narrated by Mir Baqar Ali, dastango of Delhi. Mir Baqar Ali may be deemed as the tail-ender of the long line of the great masters of this art who had already receded in oblivion with the passage of time. After losing all his patrons one after the other, he made arrangements for a daily mahfil-i-dastan at his residence. The entry fee was a one-anna ticket. It went on well for some time. But one evening he saw with dismay his listeners madly rushing to see bioscope which had newly arrived in Delhi. This compelled him to say goodbye to his life long passion for dastan. He was last seen wandering as a vendor selling finely cut bettle-nuts in the streets of Delhi. He died in 1928. This death may also be seen as the sad end of dastan goi. The dismissive attitude against Dastani fiction developed under the influence of Reformist Movement during post-1857 era and continued unchallenged for about a century. The reformists, the progressives and the modernists of thirties and forties were all at one in dismissing this fiction as something outdated, absurd and decadent. This century-old assessment of a whole tradition of fiction came gradually under scrutiny during post-partition decades. The first challenge to this assessment came during fifties from Mohammad Hasan Askari, who made a selection from Tilism-i-Hoshruba from a realistic point of view. He asserted that this seemingly fantastic tale has more to offer in the form of realistic portrayals of our social conditions than any modern fiction writer of Urdu writing in realistic fiction. In later years, Prof Suhail Ahmad Khan came out with a research thesis where the dastans were interpreted in a symbolic way and were found meaningful on a deeper level. Frances Pritchett of Columbia University, while researching on dastans, brought out a summarized version in English of a part of Dastan-i-Amir Hamza with a detailed introduction for the benefit of her western readers. Shamsurrahman Farooqi, who had started as a zealous advocate of modernism in Urdu eventually turned to dastans. He dived deep in the vast ocean of Dastan-i-Amir Humza, which runs in forty six bulky volumes. He has as yet brought out the first volume of his proposed detailed study of this monumental work of fiction. So the appearance of these two dastan gos is not something accidental. They have made their appearance in the sequence of a revived interest in the long forgotten dastan tradition. But unlike the old dastan gos they have opened their eyes in the new environments and seem adjusted to it. Mrs Shahnaz Aijazuddin had the opportunity to see them demonstrating their art in the new environs of India International Centre of Delhi. She was the one who had brought to us the news of such a rebirth in the city of Delhi. The Mohatta Palace, Karachi performance in progress. Who hasn't been fascinated with stories? Dating back to medieval Iran, the tradition of telling stories (Dastaan goi) has always held an enchanting charisma. Narrators or dastaan gohs since those times of grandeur have carried this art of conveying events in words, images, and sounds and have recited magical tales around camp fires, street corners, in coffee houses and even palaces. Last week in Karachi, Lahore and Islamabad, the magic of Dastaan goi was shared by a talented duo from India, Mahmood Farooqui and Murtaza Danish Husain, who enthralled their audience and captured the imagination of their Pakistani fans. The Dastaan goi evenings were the latest fundraising events held by STCF, a dedicated group of Supporters of The Citizens Foundation (TCF), which is one of the largest non-profit organizations in the field of education in Pakistan. TCF has built more than 300 purpose-built schools nation-wide and provides quality education to about 40, 000 economically less-privileged children dwelling in urban slums and rural areas of the country. The funds raised from the events went towards TCF's nation-wide Education Program. Held in Karachi on the 3rd and 4th of April at the Mohatta Palace Museum and FTC Auditorium respectively, these evenings had a charm of their own. The timeless beauty of Mohatta Palace and the unfolding excitement of Tilism-e-Hoshruba held the audience spell-bound. At FTC Auditorium, in stark contrast to the night-black stage drop, the Dastaan gohs donned white and settled on a simple white masnad with bolsters surrounded by glittering silver ware and burning candles. They wove their tale so beautifully and animatedly that at the end of their narration, the avid listeners requested an encore, a request graciously obliged by the story-tellers. On 5th April 2007 at the National Library Auditorium in Islamabad, it was yet another night of splendor. In their impeccable Urdu, Mahmood and Murtaza, took everyone back to the world of sorcerers, demons, warriors, Laqa the giant and many more. Filled to its capacity, the auditorium witnessed a successful event. 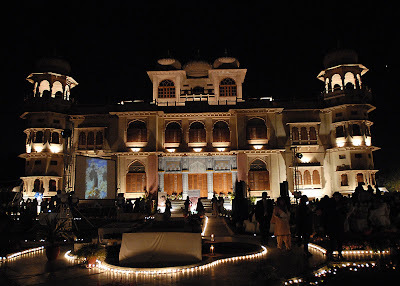 In Lahore, under the starry nights at Bagh-e-Jinnah Open Air Theatre, Dastaan goi was held on the 7th and 8th of April. Consisting of one of the oldest theatres of the city, Bagh-e-Jinnah came alive with the imagery created by Mahmood and Murtaza. Over 800 enthusiasts enjoyed the magical evening at Bagh-e-Jinnah. Anusha Rizvi from India was the Executive Producer, costume and set designer of these events. Formerly a television journalist, she is now an independent filmmaker and is currently working on her first feature film for which she has also written the script. Mahmood Farooqui is a Delhi based Dastaan go, writer, actor, and theater director. He is currently working on his first book based on the Uprising of 1857. Danish Husain on the other hand is a man of theater also based in Delhi, who has distinguished himself as an accomplished dastaan go. He is also a published poet and writer. Karachi has gradually witnessed a revival of sorts in the field of theatre with sporadic performances in English and Urdu taking place at the initiation of different theatre groups. However, while the English plays have been mostly confined to the enactment of comedies or murder mysteries, it is in the Urdu genre that some refreshing activity has been taking place. One example is Dastan Goi, a performance held by Friends of The Citizen's Foundation to raise funds for the establishment of quality schools in low income localities. Dastan goi is a tradition dating back to medieval Iran, where narrators or dastan-gohs, inspired by the Shahnama — a story of kings composed in verse by the famous poet, Firdausi — recited tales around camp fires, in coffee houses and palaces. The stories revolved around fearless princes who fought evil kings with the help of tricksters called ayyars — Amar Ayyar being the greatest ayyar of the age. Invariably, the latter encountered demons, magicians and jinns and thanks to their mastery at disguise and their zambil—a little potli that houses all kinds of elements ranging from demons and jinns, to varied booty — emerged victorious. The most famous version of Dastan goi is the Dastan of Hamza, based on Amir Hamza, uncle of the Prophet Mohammed (PBUH). Printed in 46 huge volumes, the stories make for a fascinating read about the world of fantasy. They make for an even more riveting listening when told by expert narrators, as the audience discovered much to their pleasure the evening they witnessed the performance of excerpts from Tilism-i-Hoshruba, the most famous chapter from the book. Recited wonderfully by Murtza Daanish Husain and Mahmud Farooqui, both Delhi-based actors, the performance was divided into three episodes. The first episode revolved around Afrasiyab's (the emperor of sorcerers) forces trying to capture the deceptive Amar by using birds that could see through his guises and recognise him. Amar proves too clever for his opponents though, and manages to hoodwink them not once, not twice but thrice. The hilarious descriptions of his guile must have undoubtedly made the imagination of everyone in the audience work overtime. The second episode was not as graphic or gripping as the first and revolved around Amar Ayyar not being able to eat or drink thanks to becoming a victim of magic by the evil doers. A long theosophical discussion ensued between them, with Ayyar emerging — one guess — victorious. However, while the recital of the second piece was taking place a row of ladies sitting smack in the centre of the auditorium got up and left. As if offended by this rude behaviour, the two performers completed their second episode and then abruptly announced that the programme had ended, throwing the organisers as much off-guard as anyone else. The management quickly called for bouquets to be distributed to the artists — including one for the visiting executive producer, Anusha Rizvi. But, just as people began to prepare to leave, Khalid Ahmed got up and spoke to the duo, and at his request they sat down again, this time to present the best episode of the evening. Although the first two performances had not been staged on the opening show the previous evening, the third was a repetition. But I am sure that those who had witnessed it earlier as well must have enjoyed it just as thoroughly the second time round. This time the story revolved around Afrasiyab who has stolen the Lauh-i-Tilismi (which contains all the secrets of the Tilism) and the trickery of Amar Ayyaar who disguises himself as the wife of his adversary to ferret information about the location of the coveted treasure of sorts. The performance helped drive home the point that props and costumes are not necessary to ensure an entertaining programme. Nor is a lot of movement and dramatic action required to grip the audience's attention. 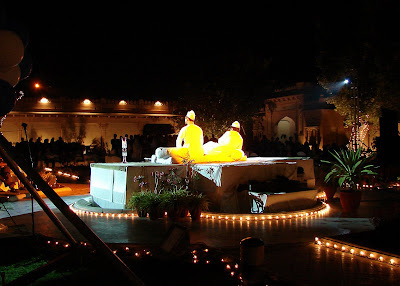 Using a simple takht to seat the two performers, and decorative accessories such as a candle-stand, lantern, silver jug and bowl, the duo was able to keep the audience captive, merely by the inflections in their voice and facial expressions. More such ventures will go a long way in keeping the wonderful tradition of daston goi alive. 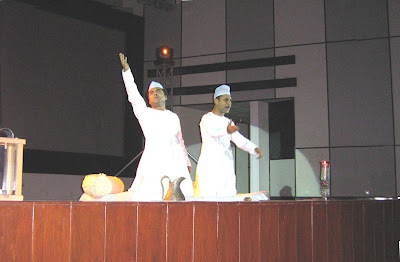 first Dastangoi performance in Pakistan. An evening of dastaangoi – to recite or perform a dastaan – proved to be a significant effort for the revival of a form that had disappeared from the scene of performing arts for almost a century. Dastaangos, Mahmood Farooqui and Danish Husain, who get the credit of reviving the art form, have been going all over India performing their own versions of the old tales. Last week they were invited by The Citizen Foundation to perform in Pakistan to a gathering of a fairly sophisticated audience, a mix of bureaucrats, professionals and all of them friends and supporters. The duo, reciting excerpts from Tilism-e-Hoshruba, 'the enchantment that steals away the senses' took the captive audience into the magical world full of fairies and jinns, and magicians and sorcerers. The audience probably suffered the handicap of not possessing the necessary competence in Urdu, but was completely awe-struck by the prodigious memory and wide range of acting by the 21st Century daastango. The funds are being raised by The Citizen's Foundation to make education affordable and accessible to every child, especially to the less fortunate youth of Pakistan. Already running more than 300 schools with about 40,000 children enrolled, TCF makes great efforts in organizing events that are different from the run-of-the mill kind and puts in a lot of efforts to make them a success. The fact that the audience were very punctual in arriving at the venue speaks for the trust and credibility TCF enjoys with its supporters. The event took place at the National Library, although the organization usually hires services of a posh five-star hotel for their functions, followed by high tea. Whether it was the old art form of dastaangoi or the venue, but for some reason many socialites, who are a permanent feature of the TCF functions in the capital and elsewhere, were missing from this one. 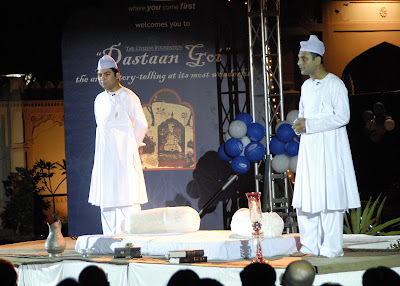 A very basic stage, with a mattress covered with white sheet in the centre, incense wafting on both sides, the two dastaangoh in pure white, angarkha style kurta pyjama and white topi in their hands, sat in the centre. The performers modestly advised the audience, "not to be anxious to understand each and every sentence". The sense would flow equally from the ambience and the mood. And added, "But if you want to praise us, taali na peet dejey ga, Angarez ki tarha. Wah wah kahey ga." (Do not clap, like the English, but praise us with echoes of wah wah) A glossary of names and recurring words had been circulated amongst the audience before the performance. Seated most of the time, they gave the audience a taste of the Urdu language when this essentially long oral narrative was cultivated. They took the audience into the world of the Dastaan, which is rich, vivid and staunchly secular where beautiful women seduce with wine. The Dastaan-e-Amir Hamza and its extended version Talism-e-Hosh Ruba, a fictionized account of adventures of Amir Hamza and his friends Umroo, is one of the masterpieces from the treasure of Urdu stories. Amir Hamza, an uncle of the Holy Prophet Mohammad (PBUH) was earmarked by angles, fairies and prophets as the arch defender of the faith, the slayer of evil and the destroyer of false Gods. Amir Hamza and Umroo Ayyar collections were first published centuries ago – around AD1100 – a collection of stories written to entertain the Muslim emperors who ruled at the time. A grand epic from the Islamic cultures of the Middle East and beyond, prevalent for centuries as an oral form, the Dastaan with its unique literary flavour offers a complete and continuous oral narrative. It is still widely read in expurgated versions throughout the Indo-Pak subcontinent. These books were the staple diet of kids growing up in the 70s and 80s. The stories are gripping, full of suspense, horror, black magic, fantasy and action. And as they say, these stories were here before Tolkien wrote his Lord of the Rings or JK Rowling's Harry Potter series. But surprisingly, besides the numerous volumes, it is actually the dastango who fills in all the masala, the details and the dialogue in the otherwise simple story to make it colourful. He takes us to distant lands and different people who speak in different dialects. It is this act that has promoted this tradition into an art form of dastaangoi. In the world of today, when one wishes there were more than 24 hours in a day and more than seven days in a week, and when the patience is wearing out, to revive dastaangoi is clearly an act of courage for which the performers Mahmood Farooqui and Danish Husain deserve to be praised.